If you’re experiencing heel pain on a regular basis, you have to do something about it ASAP. Luckily for you, the solution isn’t complicated at all. You just need to get your hands on a good foot roller. However, since heel pain is your major foot problem, buy something specifically designed for that. Don’t go anywhere for we’re about to show you the best foot roller for plantar fasciitis. Using TheraFlow Dual Foot Massager Roller will feel like heaven on earth. It can completely relieve pain by soothing your feet. It has a relaxing effect you’ll find irresistible. If you’re in a hurry to combat plantar fasciitis, this product is perfect for you. It can significantly reduce heel pain in just a few days. Don’t worry about the durability of this wooden foot roller. It is so sturdy that it can last for a lifetime. Why does it have to be made of wood anyway? The best thing about this material is it won’t slide on carpets or rugs. That means you may use this foot roller anywhere in your home or office. As a plus, this manual foot massager is compact and attractive. You’ll be proud to show it off in your workplace. More importantly, it fits well under any desk. A single foot roller can be tricky to use. You have to know how to control so it won’t roll away from you. 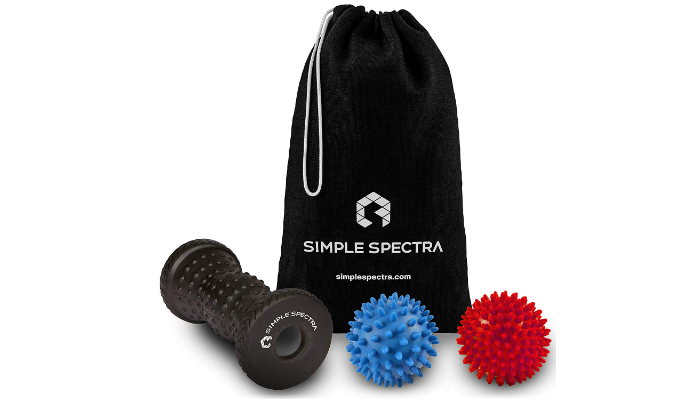 Good thing that Simple Spectra Foot Massager Roller moves smoothly for your convenience. This set has two types of foot rollers in case you’d have a hard time with either one of them. If the ball is too difficult for you, at least you’ll have an alternative. 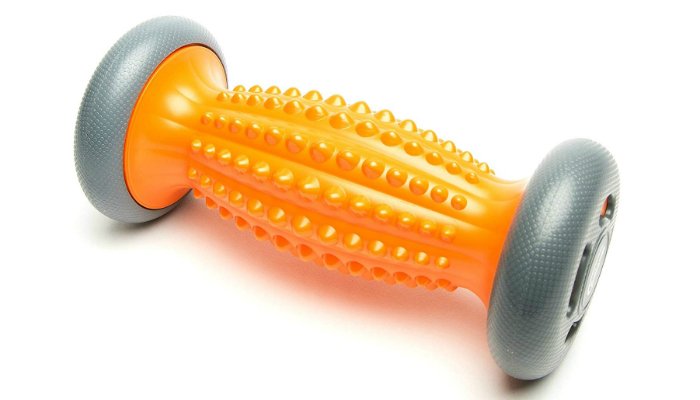 Because of its spiky texture, Pasnity Foot Massage Roller can give you a deep-tissue massage. That’s why it’s therapeutic for your plantar fasciitis. This foot roller is made of polyurethane (PU) and thermoplastic elastomer (TPE). These materials make sure that the roller will retain its form for years to come. If this type of foot roller is enough for you, then go for this option. Natural Chemistree Foot Massage Roller can relieve plantar fasciitis fast even if you’re moving a lot every day. The shape of this product will perfectly cradle the sole of your foot. This ensures a deeper massage. Aside from the typical ball and spiked roller, Maogani Foot Massager Roller also includes free braces for arch support. It aims to help people with multiple foot problems. We know what you’re thinking – the ball looks different. It doesn’t have spikes. However, it is harder than most ball rollers for a more serious massage. 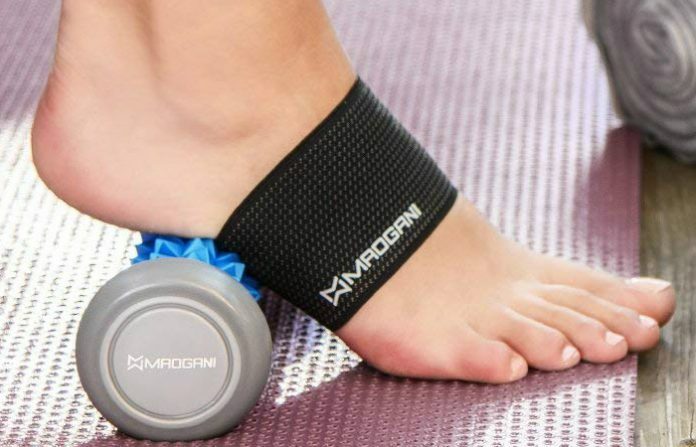 With its unique size, shape, and texture, TheraBand Foot Roller is a must-have. And, the best part, it is very affordable. Given that it’s super-clean after use, this product can be placed inside the fridge or freezer. It will get ice-cold, which leads to a more refreshing foot massage. Since this foot roller is longer and slimmer than other choices, you may bring it anywhere. It can fit most handbags. Are smaller foot rollers better? Well, it depends on your needs and lifestyle. 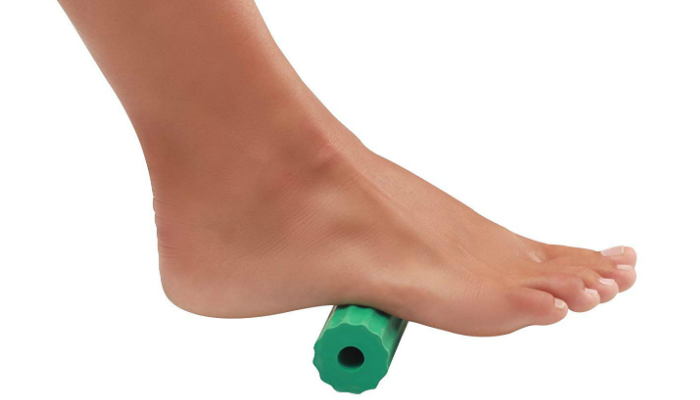 If you’re experiencing heel pain every day, it’s best to settle for a bigger foot roller. Large rollers can accommodate both of your feet at the same time. For the sake of portability despite the larger size, choose one that’s lightweight and compact. You may need a bigger bag for this, but that’s only to fully cover the frame of the roller. There will still be room for other stuff. If your plantar fasciitis isn’t really severe, feel free to buy a small roller. Rubber balls can definitely fit any purse or bag. By considering material, you’ll be able to think about durability and effectiveness as well. In this section, we’re going to focus on wood and rubber. Larger options are usually made of wood. They’re perfect for people with big feet. Wooden foot rollers are also rougher because of their bigger spikes. This proves how effective they are. After all, the spikier the roller, the deeper the massage. On the other hand, rubber foot rollers are smaller. You can’t place both of your feet on them. However, small rollers can be more effective when used correctly. With better control, you’ll easily target the most painful spot in your foot. Differences aside, both wood and rubber foot rollers are durable. That’s why these materials are very common for this kind of product. Considering the purpose of foot rollers, you really need to clean them. This is even more crucial for the rubber type because it can retain odor. Just imagine putting a dirty rubber ball in your bag. Regular cleaning of foot rollers will also save their appearance. In particular, wooden rollers have the tendency to stain. 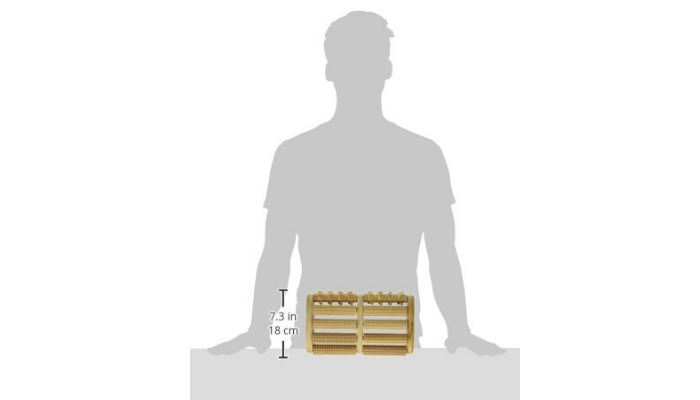 To ensure cleaning convenience, check the type of wood used for a wooden roller. Some variations look more beautiful as they age – even with less maintenance. When it comes to rubber foot rollers, smoother ones are obviously easier to clean. Spiky rollers, on the other hand, require a bit of scrubbing. By the way, before you hit the store to buy a foot roller, you should consult a specialist first. You might have underlying health conditions you need to look into. It turns out that foot pain can be a symptom of something more serious. 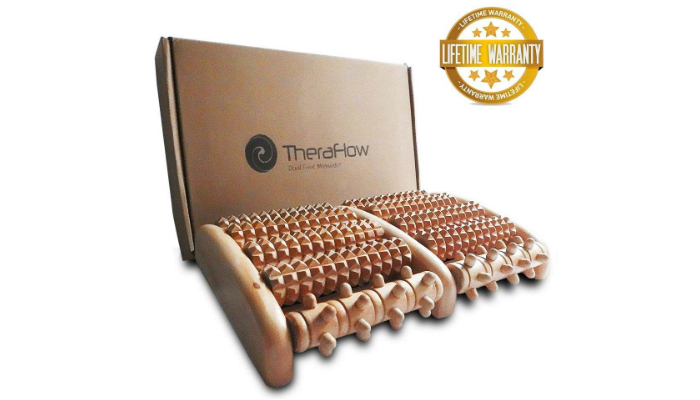 Since we’re pretty adamant about the benefits of the wooden type, we selected TheraFlow Dual Foot Massager Roller as the top product. 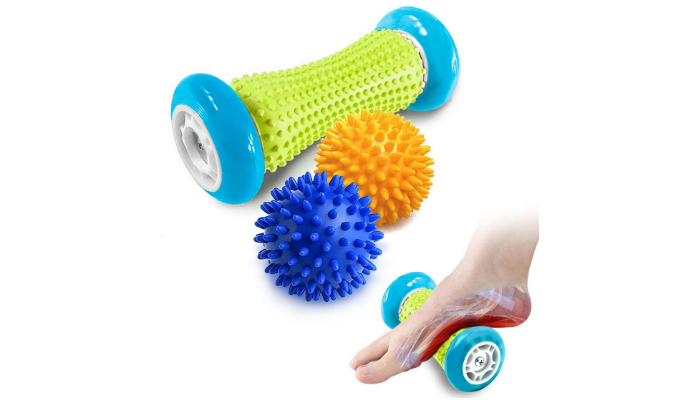 It is the best foot roller for plantar fasciitis because of its size and material. Unlike other choices, it can effortlessly massage both feet. If you prefer the automatic type, you might like foot massage machines. In fact, they have other benefits aside from relieving plantar fasciitis.